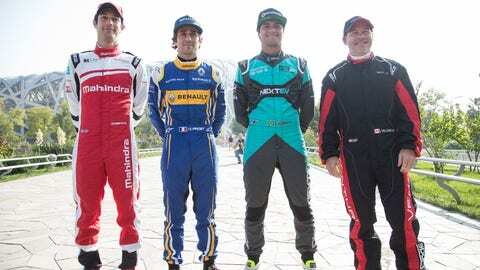 Famous offspring and Formula E drivers (L to R) Bruno Senna, Nico Prost, Nelson Piquet Jr. and Jacques Villeneuve, seen in Beijing, China on Friday, Oct. 23. Jacques Villeneuve joins an already-impressive list of names for the Beijing ePrix, including Nico Prost, Nelson Piquet Jr. and Bruno Senna, as 18 drivers get set for the season-opening Beijing ePrix, which is set to kick off LIVE at 3:30 a.m. ET Saturday morning on FS1. Prost topped the timing sheets on Friday with a 1:37.291, over four seconds faster than Bruno Senna’s top time of a 1:41.341 last season. However, some of that time can be attributed to the fact that the first chicane has been removed, although the second chicane has been tightened. The field was reduced from 20 to 18 cars after Trulli Formula E team’s Motomatica JT-01 was not submitted for the official scrutineering process ahead of the event. Trulli’s drivers for this season are listed as Vitantonio Liuzzi and Salvador Duran. The team claimed that key components had been held up in customs and were granted an extension to submit these for sealing. These components were not submitted in time.